"The Misadventures of Hershey & Rolo and the Broken Flowerpot"
New Children’s Book About Honesty Asks Who Broke the Flowerpot? TOMBALL, Texas - July 18, 2014 - PRLog -- The Misadventures of Hershey & Rolo and the Broken Flowerpot tells the story of Hershey the dog and Rolo the cat, who were the real-life pets of the author. They were true friends until Hershey passed away. This is their wonderful cat and dog’s tail/tale! This wonderful book for young readers describes the relationship of a dog and a cat who just happen to be best friends.Their story describes the unique and unlikely bond between the animals that tests them at every turn, even when a flowerpot is broken. So who did it? This clever story is about telling the truth and how true friendship works. 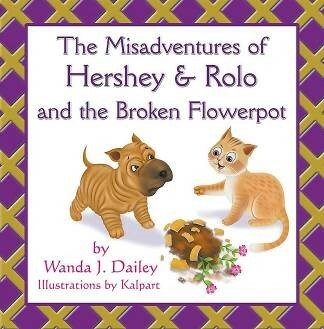 Barnes & Noble Nook: http://www.barnesandnoble.com/w/the-misadventures-of-hershey-rolo-and-the-broken-flowerpot-wanda-j-dailey/1119678743 and in multi-formats for other e-Readers through numerous vendors online. The soft cover version (ISBN: 978-1-62857-884-3, $11.50) can also be ordered through the publisher’s website: http://sbprabooks.com/WandaJDailey/ or at www.amazon.com or http://search.barnesandnoble.com. About the Author: Wanda J. Dailey lives in the great state of Texas and has 16 grandchildren.